Does its lack of HD audio decoders limit this Onkyo's cinephile appeal? 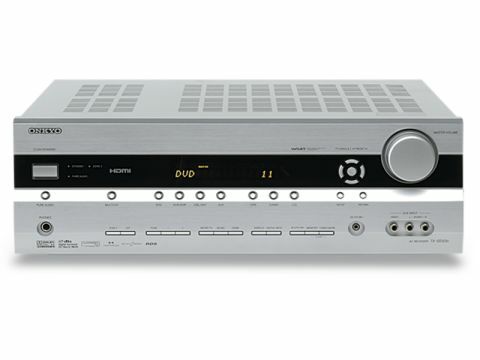 Onkyo has been driving the cutting-edge of the budget AV receiver market of late and in terms of bang-per-buck the company has seemed unbeatable. But not only has the competition stiffened these days, the Onkyo TX-SR576 is already looking long in the tooth and may seem at a bit of a disadvantage compared to the newer kids on the block; it doesn't give too much away in terms of core power and performance statistics, but it only has v1.2 HDMI connectivity and a serious dearth of decoding for new HD audio formats – no Dolby TrueHD or DTS-HD Master Audio, here. But, hang on a moment. Sony's PlayStation 3 can decode both Dolby TrueHD and DTS Master Audio into LPCM, meaning that all HD audio soundtracks on Blu-ray disc can be sent to the receiver. So does not having HD audio decoding really matter? Well, not a lot. Good job then that it offers adequate power (81W with all channels driven), Audyssey 2EQ RoomEQ/auto setup and pretty decent connectivity. The sound is everything I've come to expect from contemporary Onkyo AVRs, ﬁghting well above its price point in drive and clarity. The denser cut-scenes of Viking... are laid out in a huge room-ﬁlling wall of sound that leaves you in no doubt that you are deep into the game. The metallic effects have a good leading-edge attack and the echoes ring out into the back of the room. This AVR has plenty of oomph on tap but it gets very, hot at high volume. Switch to movies and it is so easy to see why Onkyo has been on ﬁne form. Fifth Element is presented with considerable scale, enormous effects and crisp dialogue. However, the centre channel is a little laid-back for my taste and the Audyssey EQ is not easy to tweak using the amp's only interface – the fascia display. Fiddly ergonomics aside, the sound is thoroughly enjoyable, albeit not possessing the clarity of the similarly-priced Sony STR-DG820 or the Panasonic SA-BX500. But while pushing the volume to its limits, the amp section gets hot near the HDMI board, and it wasn't long before I began to fear that the receiver was heading for a meltdown. Onkyo's are traditionally hot to trot. None more so than this model. That said, this model appears a solid offering if you intend to base your system around the PS3.